Home care measures for sinus symptoms should focus on relieving nasal congestion, sinus pain and fever. Moisture alleviates nasal congestion, so 20 minutes in a steamy shower, and a cool mist humidifier in the room where your child sleeps will help keep the air moist. Sinus pain and pressure can be relieved with a cold compress and a pain reducing medication (such as ibuprofen or acetaminophen). 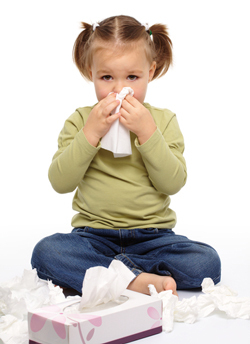 Antihistamines and decongestants should be avoided as their effect is thickening of the nasal mucus. Because sinus infections are usually secondary to colds, prevention techniques should focus on the reduction of colds. Good hand-washing should be the first line of defense in reducing your child’s exposure to viral infections. If you are unsure about the severity of your child’s ongoing symptoms or if evaluation is necessary, it is better to err on the side of caution. Call us for a consultation, and we’ll get your little one feeling better in no time.